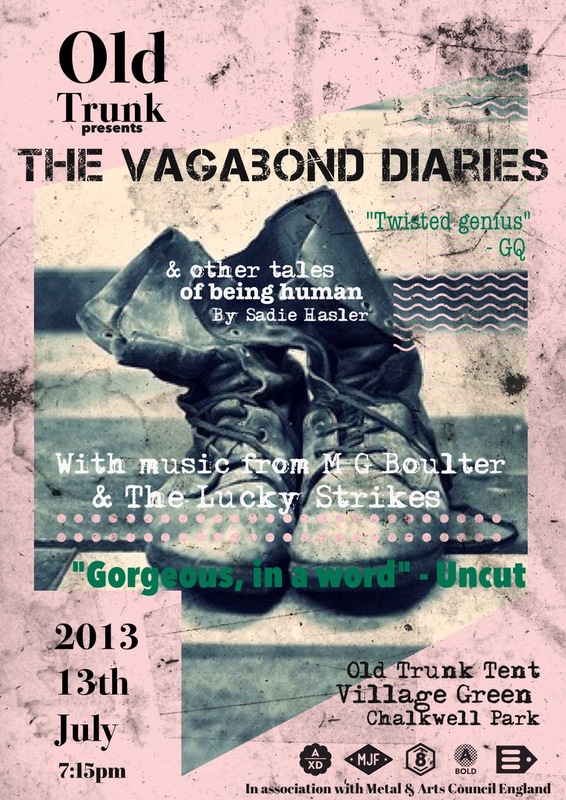 The Vagabond Diaries – stories of being human by Sadie Hasler accompanied live by M G Boulter & The Lucky Strikes – premiered in the Old Trunk theatre at Village Green Festival 2013. The piece was read by actor David Streames. This is the 47th year of my writing a diary every day. I would say I have written it religiously but there have been days, as we are all like to have, when I have not been all that religious. There have been days, as we are all like to have, when I might say I have written in poor reverence to the lord. I have had bad thoughts, I have cheeked people without their knowing, stolen small and large items according to need or want, have cast my eye too long on a raised skirt far more than a Christian man might, and I have cussed, but have always seen fit to scribble the badness out. My diary has more black lines than words. Some days are just great black lines, and now that I am in my 62nd year I cannot always remember what went there in the first place. I feel a little like starting again. Writing a new date, that has never yet existed, of telling you, whoever you are – for who do we write to when we write a diary? I do not know – telling you, a you whom I do not know, who I am. If anyone ever knows such a thing. I would start, I suppose, with my name. I could do that. I can and so I will. My name is Clarence Larchsap. I had a nickname once, but I forget what it was or who saw fit to give it me. I suppose I might next tell you I was born in a little town in South Carolina. For I was. The name, I suppose, does not matter. Its topographical features, how I travelled around them and what I did within them matters not either. I could inform you of a great many biographical details, as people seem so set on doing, as though telling you things about themselves makes them exist a bit more, but I shall not. Schooling, love, happy days and friendship, they didn’t last and mean little to me now. Parentage, even, those broken souls who forerun our own blighted journeys, that too has come to mean no more than a quick sigh and is not something I can stretch out to lay on the paper. So why do I write, what do I store in these pages? I think I write to pass the time. If I did not write as I sat I would not know what to do. I cannot just be. I suppose you might call me a man of few roots, a traveller, a vagrant, a vagabond. I move about. People don’t tend to want a man with such a character to stick around. And so I keep moving. Having such an…anti-social proclivity does not invite your welcome in most places. People like their stuff to remain intact. Unburned. I try to respect that by not sticking around after I have reduced their property to cinders. Sometimes I will pass through without giving in to the calling of the match in my pocket, which always burns there even before it is struck. And sometimes I permit myself. Sometimes I plan it in detail, and sometimes I do not know I have done it until I stand there with the hard honest heat on my cheeks. Was I set off at a state of unrest, born as I was during an earthquake? Did the noise and chaos of nature set itself thudding in my heart from the moment I burst out into the air? I don’t suppose to know. I know only one real thing. As soon as my eyes could flicker, as soon as my fingers could curl and pinch and reach towards the things I wanted, I was drawn to flame. I would disregard all toys and books, I would ignore all beauty and spectacle, if I could look instead at fire. Even a lamplight in its last juddering breath would hold my attention more than the desire-struck face of the most beautiful woman in the world. She is nothing next to it. You might say I was an arsonist. I suppose most people would. But I do not think the word does justice to the sight of something reducing itself down to ash in the blinding searing heat of a man acting in the thrall of his own secret will – something condemned to nothing in the smallest of moments. The word says nothing of this, so I prefer to leave myself uncategorised. Perhaps it is sickness. Perhaps it is a revenge against something I cannot remember from my past. Perhaps it is a struggle with myself, with the world, with God himself. Dear Diary, I do not know or I would tell you. But I will say, with the candour you can stow in a diary – this most loyal of friends, silent as ash – I will say, as a final thing before I take my night-time’s perambulation around all that dry matter people build up, those frames for future fires – I will say, before I move on in the morning – nothing shines quite a light like a thing you have set aflame yourself. Simply put, between two friends, I just like burning stuff down.